The second of two TSA security checkpoints at Tucson International Airport (TUS) opened Wednesday (September 20), completing another significant portion of the airport’s ‘A Brighter TUS’ terminal renovation. The A Concourse checkpoint is for passengers departing on Southwest and United airlines. 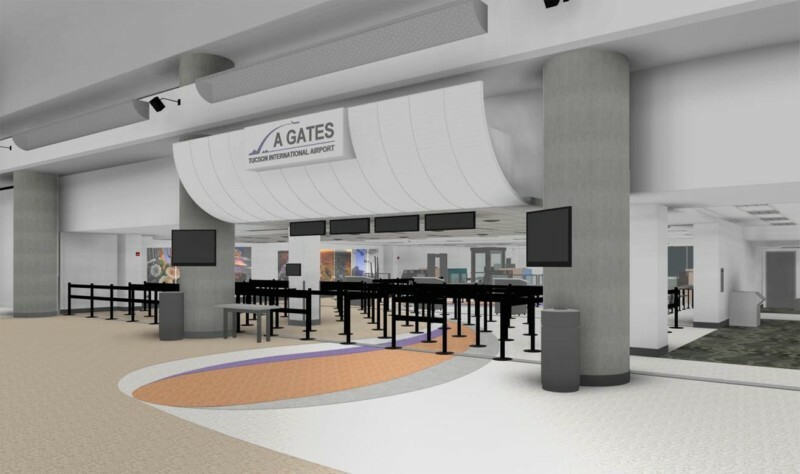 The improved checkpoint for the B Concourse serving passengers on Alaska, American and Delta airlines, opened in April. Passengers departing on Southwest and United airlines now enter the A Concourse through the Transportation Security Administration’s checkpoint at the east end of the terminal on the ticketing level. The expanded checkpoint allows for an expanded configuration of TSA’s security equipment and provides additional room for a fourth lane to potentially be added. Additions include a new recomposure area for passengers to gather themselves after going through the security. The new checkpoints opens up more area on the concourses for additional retail, food and beverage options as well as a business center.